Recipe was picked specially that ingredients are relatively not difficult to buy in Ukraine. Corma refers to «not hot» curry. Dice chicken fillet (breast) at 2х2 сm. Fry fillet in pan with thick bottom in some amount of oil (8-10 min), stirring, till brown color, remove (with the scoop with holes, so that more oil left in the pan) on a paper napkin. In hot oil, in the same pan add the grains of cardamom and fry for 2 minutes (they will be a bit «inflated»). then add the chopped onion and cook for approximately 5 minutes, until golden brown. Garlic and ginger root grind a blender or food processor with 2 tbsp of water to the state of «paste». Ginger-garlic paste add to the onion, add ground cumin, salt and turmeric, ground almonds and cook for approximately 5 minutes, stirring occasionally. Then add coconut and half the amount of sour cream (by spoon, stir well, reduce fire to a minimum). Add chicken to the pan, stir and cook with the lid for 5-6 minutes over low heat. Then add the remaining sour cream, stir and cook for about 5 minutes, to readiness. 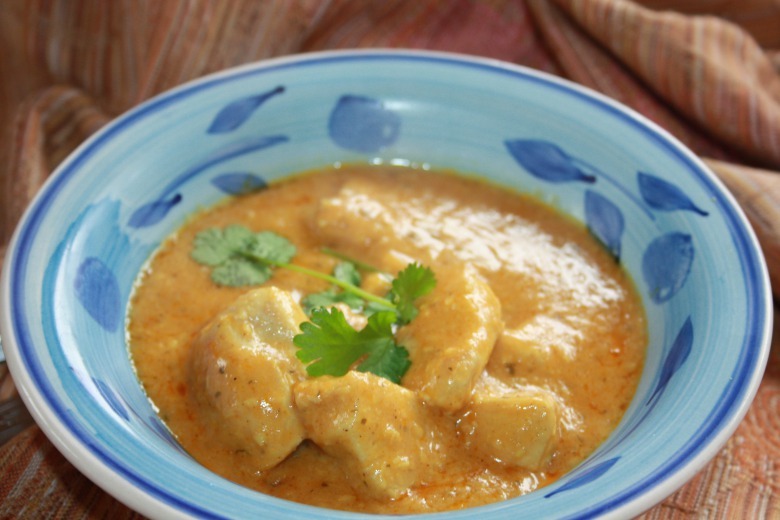 Serve with rice and bread naan, sprinkle with chopped coriander and almonds (slightly brown in dry pan or in the oven, carefully, because if to overbake, ie when the almond becomes brown, it 'bitters"). 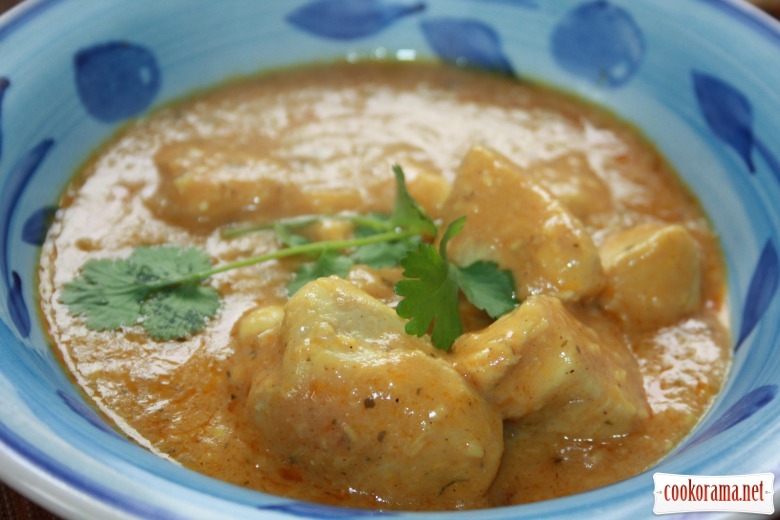 Top of recipe "Indian curry "corma" (chicken in sour cream sauce with almonds, coconut and spices)"